These Oversized "BIG" Checks can be used printed as an actual check or for fun and not to be cashed. Either way, you are bound to get some fun and laughter out of them and here you have the power to make them that way with our online design tool. These Large Bank checks are always a hit, and always a great attention or media getter. So what are you waiting for? 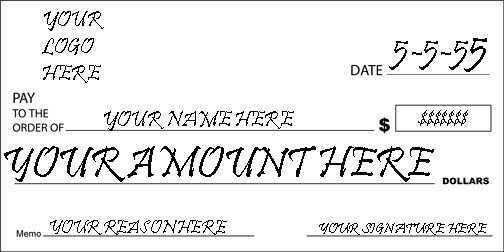 Design your very own Custom Oversized Blank Novelty Check today!